Welcome to our neighbourhood group website! widcombewest comprises residents living in the West Widcombe area, which roughly encompasses Calton Road, Calton Walk and Calton Gardens, Holloway, the lower part of Lyncombe Hill, St. Mark’s Road, Alexandra Road and the Lower Wells Road. 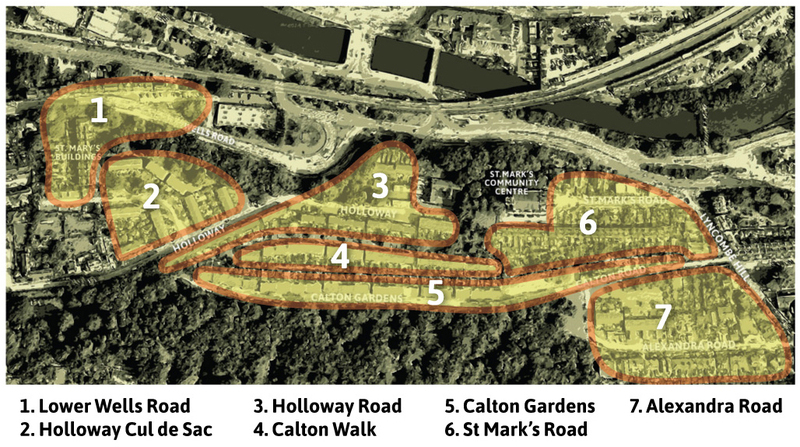 The group is a merger of what was known as Action for Residents of Calton and Holloway (ARCH) and the St. Mark’s Road residents group. These areas and their history are described in more detail on their own pages. While the focus of each area may differ slightly for geographical reasons, our projects, activities, and concerns and communications are joint efforts with the common underlying aim of making this area of Bath an attractive, enjoyable and sustainable place to live. To find out more, email us at info@widcombewest.uk. We provide a platform for airing and tackling neighbourhood concerns such as the management of Beechen Cliff, Road Safety, living in harmony with all our neighbours, planning applications and any issues of general interest that arise. We like to keep our area looking good. We hold Neighbourhood Upkeep activities such as litter picks which are rewarding and also sociable. In the winter, we organise a Snow Patrol and use grit and determination to banish ice and snow that might make our area hazardous. We also encourage residents to look out for vulnerable elderly neighbours in cold weather. There has been a lively interest in Community Gardening, making our area more liveable for us as well as bees and pollinators, and many of us are also interested in Green Living and saving energy. And finally, being part of widcombewest means a chance to get to know your neighbours. We organise regular social get-togethers, open gardens events and street parties in the summer, very often in the St Mark’s Community centre in the heart of our neighbourhood. All are welcome to join any of our activities, and we will provide support if you have new ideas. nice photo of lyncombe hill – is it in Widcombe west? Just on the edge at the beginning of St Marks Road. I have that image available as a canvas print if you are interested!